The image that keeps Laura Roth awake at night is a door. It is metallic blue with a silver door knob and a poster filled with quotes from students in Roth’s seventh-grade history class at Tappan Middle School in Ann Arbor. At night, she pictures her classroom door locked during a school shooting. According to the school’s lockdown policy, “if a student is in the hallway with a shooter, we’re not supposed to open the door,” Roth said. The 52-year-old said she plays that scenario over and over in her mind, wondering how she’d react: open the door and put the children huddled behind her at risk, or leave a 12 year old in the hall, banging on a locked blue door. “It’s ‘Sophie’s Choice,’” Roth said of the two agonizing options. 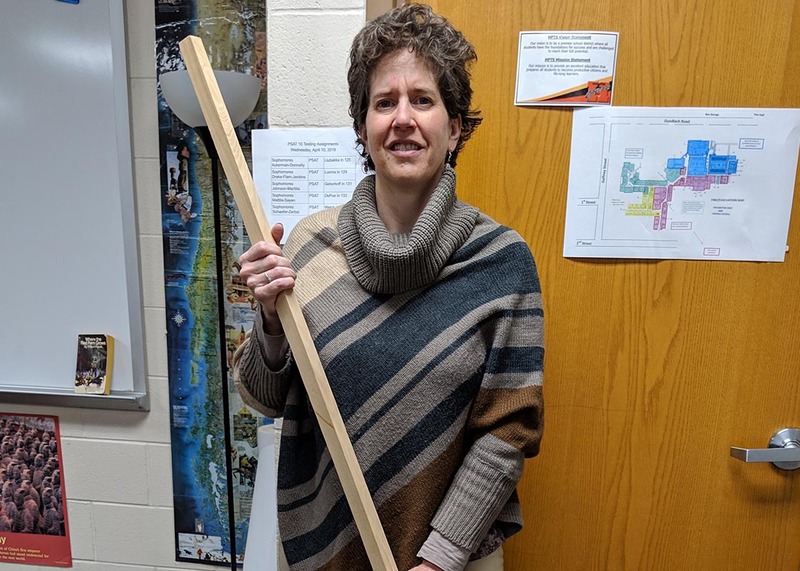 Five hundred miles to the north, an Upper Peninsula teacher told Bridge she keeps a long wooden dowel in her classroom to swing if there is an armed intruder. 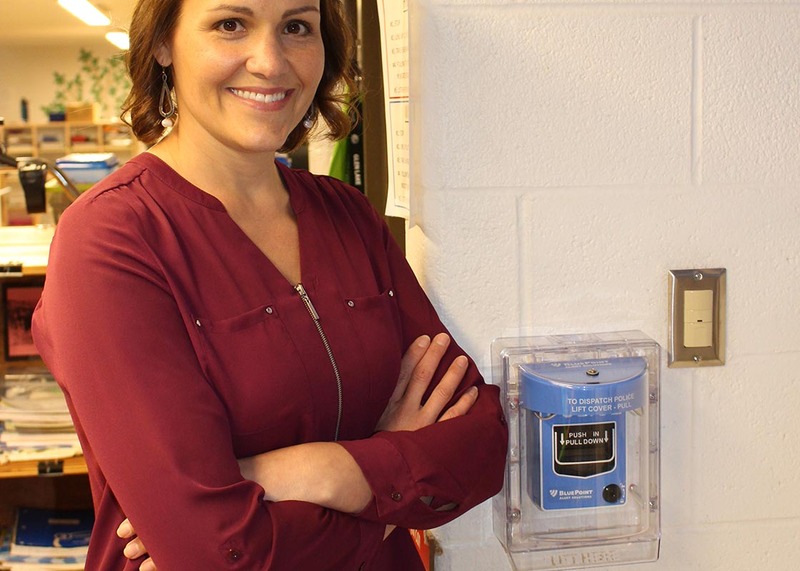 In Grand Blanc, a teacher keeps a box of hockey pucks in a cupboard for students to hurl. Third-graders at a northern Michigan school practice throwing paper wads at a teacher holding a banana. While the chances of a mass shooting at any individual school are astronomically low, active shooter preparation has become part of the fabric of school culture across the country. In Michigan, the steps taken to protect students from a school shooter vary from teacher to teacher and school to school; from six-figure, high-tech gunshot sensors, to stacked desks in front of classroom doors. Schools say they are more prepared than ever to protect students, from locked entrances to active shooter teacher training. In the past five years, the state has handed out $56 million in grants to Michigan schools for emergency preparedness, and a school safety task force released 32 pages of recommendations last year. Yet 20 years after the mass killings at Columbine High School and more than six years since 26 were slaughtered at an elementary school in Connecticut, there’s still no clear consensus nationally on what steps actually help kids survive a school shooting. Michigan does not set uniform guidelines for safety protocols in the event of an active shooter, instead leaving those decisions to individual school districts, which can vary dramatically in the resources available to protect students. In more than a dozen interviews with teachers and administrators across Michigan, educators acknowledged the cost in time and money spent preparing for something that is unlikely to ever happen in their schools. But in an era when any school could be the next Parkland or Sandy Hook, they say doing nothing is not an option. There have been 16 multiple-victim school shootings in the U.S. since 1996. On average, about 10 students a year are killed at school by gunfire, but many of those are not mass shootings. Still, schools contacted by Bridge described a range of increased security measures in recent years. Public schools are required to hold three lockdown drills each year, and the majority of educators who spoke to Bridge have undergone active shooter training in which a trainer enters a classroom and pretends to shoot them. Houghton High School in the Upper Peninsula has bolts that slide into the floor to prevent doors from being opened during a lockdown. 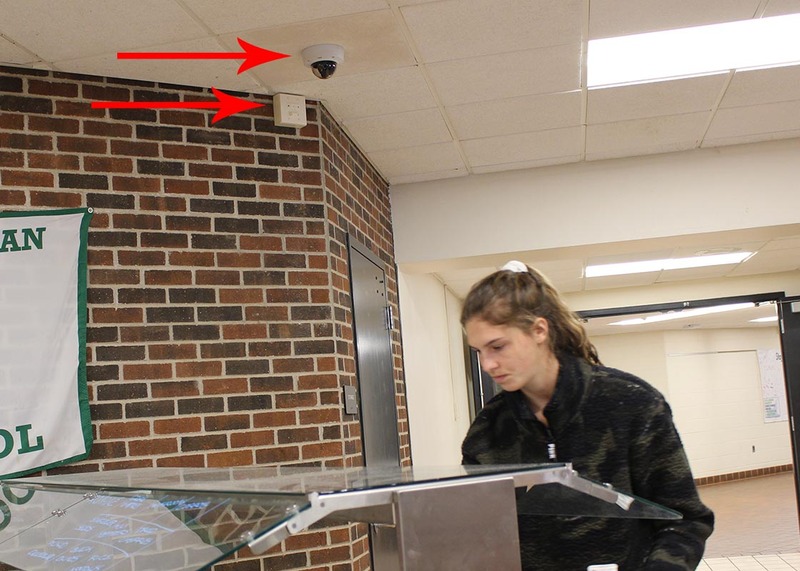 Grand Blanc, south of Flint, has security cameras through its two-building high school campus. 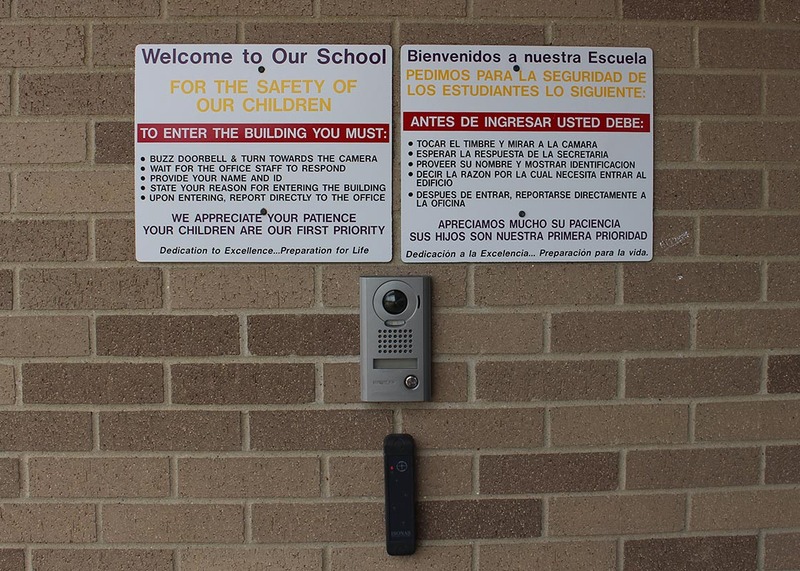 Tiny Bronson Junior-Senior High, near the Indiana border, has a camera outside its front door so school staff can see who’s at the door before buzzing them in. “I don't think there is any way that we could actually prepare for the ‘real thing,’ and I cross my fingers that we never have to,” said Ray Rickert, music teacher at Thornapple Kellogg High School in Middleville, south of Grand Rapids. “It is challenging to get the students to take the drills seriously sometimes but one thing I try to impress upon my kids is that there is a common thread among all places where these things have happened. 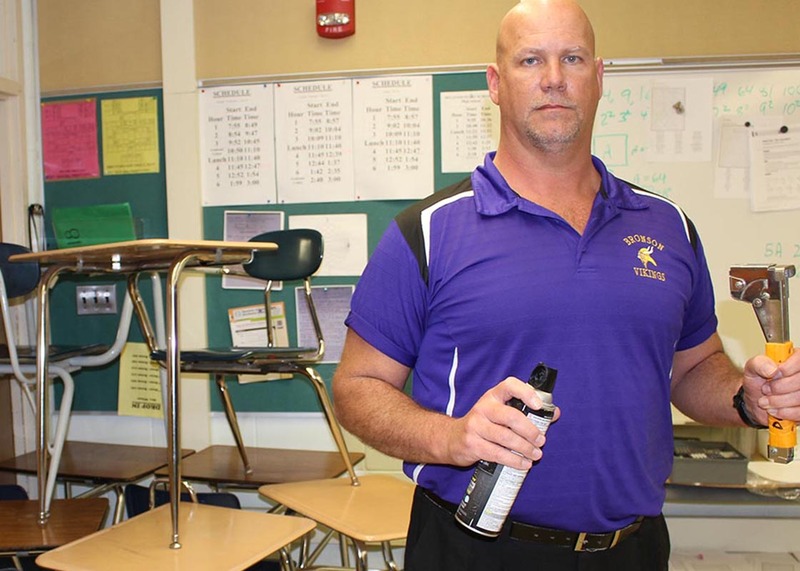 “That is that everyone says, ‘We never thought it would happen here.’"
Dan Burzynski was teaching multi-step equations to eighth-graders at Bronson one recent morning when Principal McCrea asked students to demonstrate a lockdown drill. Students move desks toward the door, where Burzynski helps stack them. With the lights turned out, students sit on the floor against a wall away from the door and windows. Students take down the barricade and build it again. Bronson is an example of a change in recommended tactics when faced with an active shooter. The prevailing theory for school safety used to be to shelter in place – huddle in a corner of a classroom and wait to be rescued. Bronson and many schools now are using ALICE (Alert, Lockdown, Inform, Counter, Evacuate) training that recommends students “counter” a shooter as a last resort by running around and throwing things at the gunman’s face rather than cowering. The idea: distract attackers so they are less accurate when they pull the trigger. In Steve Dunk’s classroom at Grand Blanc Community High School, a metal ring is mounted on the wall beside the door. 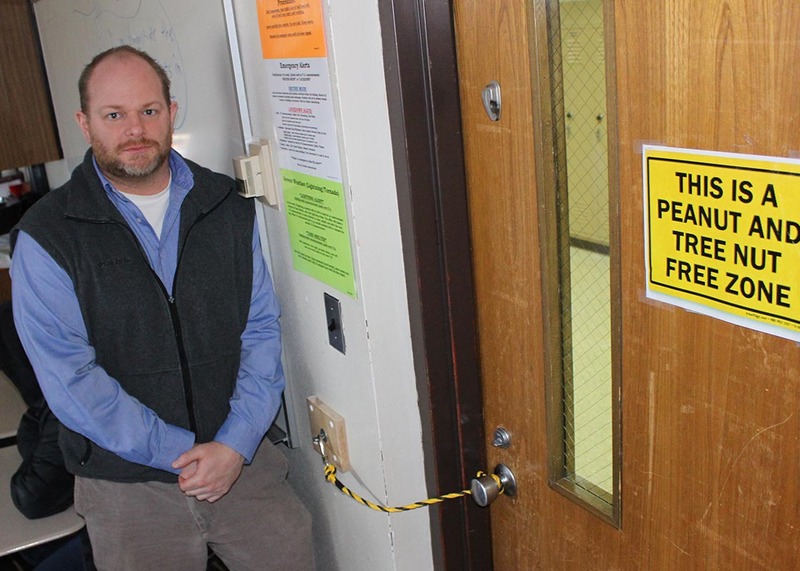 In a school lockdown, Dunk can place a nylon rope around the door knob and attach it to the metal ring to hold the door shut on the chance the door’s lock is breached. If an intruder gets past the rope, students are told to throw their school-issued Chromebook laptops. 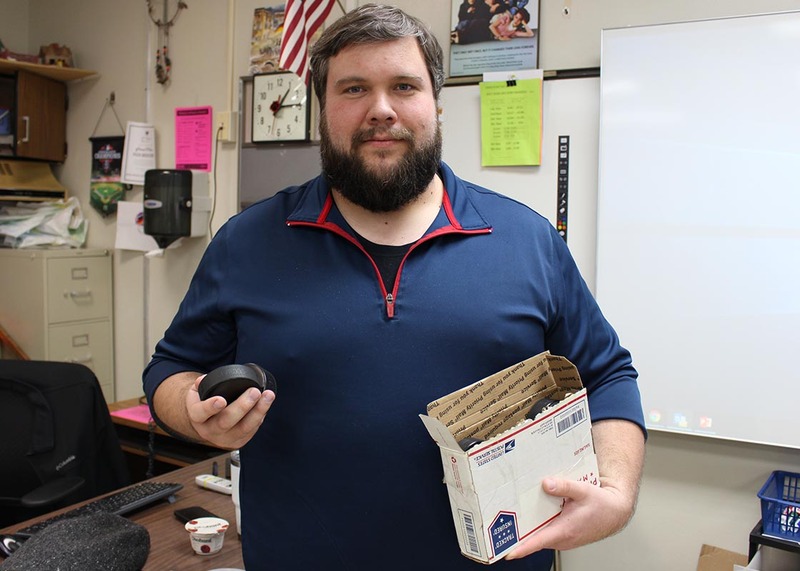 In the next-door classroom, fellow history teacher Zach Brody has a box of hockey pucks he says he would hand out to students to throw. “No one wants to pretend that by doing these things, they’re going to stop all casualties,” Dunk said. “Doing things to make sure as many survive as possible is the best we can do. Grand Blanc’s security efforts in the age of active shooters don’t stop with lockdown drills and hockey pucks. The two-building high school campus now has 27 security guards – the equivalent of one for every 100 of its 2,700 high schoolers. The annual cost: $632,000, plus another $105,000 for part of the salaries of three police officers assigned to the school. The Genesee County district is in the process of installing a door lock system in all its classrooms. The new system secures doors by dropping a bolt into the floor. The project is funded with a $243,000 school safety grant from the state. The tiny Glen Lake school district in Leelanau County has 700 students in one building near Glen Arbor and Empire. But inside that school in idyllic Up North lake country is some of the most high-tech intruder security available. There are 53 cameras – one for every 12 students - which all can be monitored from a command center in the school office. Visitors are photographed and given stickers bearing their picture and name. There are 103 alarms alarms that can be pulled to alert the school and police of security threats, including one in each classroom. Scattered around the school are 28 gunshot sensors that detect when a gun has been fired. The sensors work by detecting the sound and muzzle flash of gunfire. Police are alerted within one second of a gun being fired, and staff are sent emails and text messages. Police can tell where in the school shots have been fired, helping them find the shooter. Glen Lake is the first district in Michigan to use gunshot detectors. Cost of the pull alarms and gunshot sensors: $156,000. “People like to get on Facebook and snark at us, like, ‘Why don’t you just call 911?’” said Glen Lake Superintendent Sander Scott. Gunshot sensors are among the many items marketed to schools in today’s $2.7 billion school security industry. For example, schools can buy bulletproof whiteboards for hundreds of dollars apiece. Or not. A 2016 study by Johns Hopkins University found “limited and conflicting evidence” of “short-term and long-term effectiveness of school safety technology.” In one example, a Utah middle school had surveillance cameras, outside doors that could only be opened with IDs and a police officer. None of which stopped a boy from fatally shooting another student just outside the building in 2016. And last year in Parkland, Florida, a school that had security measures and lockdown procedures was the site of another mass shooting, because a former student knew from past drills he could pull a fire alarm and students would flood into hallways where he could target them. And when the Washington Post asked schools that had been the target of mass shootings what could have prevented the incidents, nearly half said nothing could have been done. Most told the Post they had robust security precautions in place at the time of the shootings. Not everyone sees the benefits of hardening schools, a security sector that has bloomed into a $2.7 billion industry. Northeastern University criminologist James Alan Fox said that an average of 30 students a year die while on their way to or from school. That’s three times the number who die in school shootings. Fox argues that the drumbeat of lockdown drills may cause more harm than good. In fact, one of the most reliable security measures is decidedly low-tech: keeping students and staff behind locked interior doors, which most classrooms can already do. The likelihood of a shooting actually occurring is minimum, said Marvin Nordeen, school psychologist for Traverse City Area Public Schools. But “emotions reach a point where they’re not making rational decisions” about security. 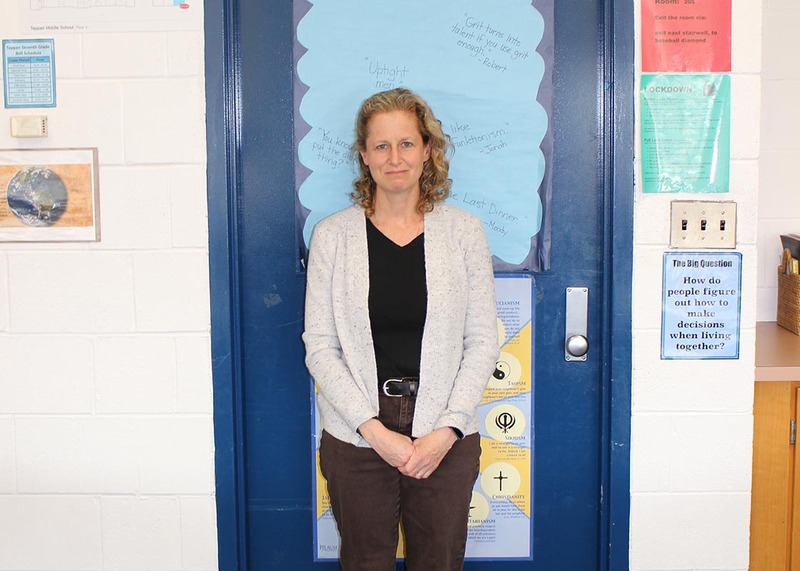 Ann Arbor middle school teacher Roth has a few set speeches she gives to students at the beginning of the year. One is on the seriousness of school security. “I say to them, ‘Your parents definitely want you to learn, they’re sending you here to learn. But even above that, they’re sending you to school with the anticipation that you’re coming home at the end of the day,’” Roth said. She said she knows the chances of a Parkland or Sandy Hook type of shooting occurring at her school are incredibly low. The drumbeat of school shootings and the training teachers in Ann Arbor and many districts have gone through – training that sometimes includes a mock shooter pretending to kill teachers – has changed what it’s like to be a teacher today. Many teachers at Tappan cover the glass in their doors so a shooter can’t see inside, Roth said. Stacking desks in front of her classroom door wouldn’t help – student desks are light and on wheels. She has potted plants by the window. Maybe she and students could throw them. “Almost everyone who goes through (active shooter) training says this is not why I got into teaching,” Roth said. “I don’t want to be a part of this. This is not what education is supposed to be. Do her students feel that same anxiety as some studies have found? Locking doors makes sense to Roth. Beyond that, she wonders if money would be better spent on mental health services for students rather than hi-tech gadgets. Roth locks the blue door of her classroom and walks down the hallway to go home for the day. “It’s overwhelming for me as an adult to figure out what to do, and not be weary of one shooting after another,” she said. "In the past five years, the state has handed out $56 million in grants to Michigan schools for emergency preparedness, and a school safety task force released 32 pages of recommendations last year." Imagine if we could just spend that money on actual education. Books, supplies, higher teacher salaries, more after-school programs. Better yet, how about a gun buy-back program? Less guns in our communities would mean lower odds for a mass shooting. But naaaah. We'll just teach 6 year olds how to throw books and staplers instead. Gun buy backs don't work. All they do is disarm law abiding people. Perps don't turn their guns in and if they do, they'll only be guns that don't fire. The bell can't be un-rung. How about armed security? School safety concerns regarding shootings have been around for a lot longer than Columbine. Detroit and most of its suburbs, Pontiac, Flint, Saginaw, Bay City, Midland, Lansing, Grand Rapids Muskegon Heights, Benton Harbor, Jackson, and a few other communities, have either have had or still have armed guards and metal detectors even at the middle school level since the early 1970's. While still far more, and too many, kids are killed every year by stabbings, etc., that system has worked well overall at reducing violence on school grounds. However, laws have changed regarding how students are handled when they are violent and what teachers are allowed to do overall. The school shooting in Arkansas changed the attitude of the Columbine shooters, and they with the resulting notoriety, changed hundreds of kids around the country to not only is shooting your classmates at school acceptable to do, but it is something which they should carry out. Yet, everyone acknowledges it but no one pays attention to it anymore. You are right, this whole exercise in emergency planning seems to be a great tool for helping expanding people's understanding of what reality outside of their sheltered environments and helping them recognize risks and develop plans to prevent or mitigate events and the risks. Consider how we were living in our sheltered worlds prior to 9/11 and how we had to confront reality created by people from outside our world in a drastic instant. Do you recall how prior to 9/11 were taught to be passive, to set back, shut-up, and let the hijacks have their way, so we weren't ready to resist the high jackers that cost thousands of lives, except for one group in one plane that became resistive and save many lives. This article describes how people are now [in a safe conditions] preparing for the realities others have experienced, this shows how people are thinking about situations that they would have ignored in the past, these are great examples of the value of such emergency planning. This is helping people learn how to recognize risks, earn how to think about managing those risks, and think about what they can do and how to rely on others. This article tells us so much more about how our schools and staff can change and create new ways to operate and work with others. This is a very encouraging article about how we can accommodate change when confronting people and events that are conspiring to change our normal world. And the lower education funding erodes learning. I watched that "Run, Hide, Fight" video. The run and hide parts are sensible, but the fight??? It shows a gunman with a long barrel magazine weapon cringing when something is thrown at him. Wouldn't the more realistic response be to raise your weapon and shoot into the crowd? While laudable to barricade the door, the school furniture I remember isn't that heavy. What t to prevent him from breaking the door window and again just spraying the room? Nothing. We just have too many guns available too easily to too many angry people who often kill themselves and sometimes try to bring along company. There was a recent New York Times article about what all these security measures are doing psychologically to kids, its not a pretty picture. Basically it was saying that adult paranoia is robbing kids of the innocence of childhood. A couple of months ago, our deputy announced the lock down drill. That threw us all because it is normally the principal. After a few seconds of staring at each other, we started throwing desks against the door. I herded my co-teacher and the kids to the corner, announced that it was not my day to die and grabbed whatever I could. I heard the rattling of the door and saw the arm of the person. I saw the gold buttons and so I knew it was just my principal and it was just a drill. But nevertheless, I had my arm pulled back to hurt a heavy stapler at his head and might have had we not locked eyes there for a moment. Pretty sure you are asking to get shot by throwing something at a shooter. I am afraid you are delusional if you think not acting will save someone. 9/11 showed that the passive die just as quickly and more easily than those that resist. If you throw something you are creating the possibly of distracting a shooter, changing their aim, disrupting their thought process, giving others time to act [also to start throwing things, escaping, sounding a warning]. The other factor is if your mind initiating an attack it is open to other actions, you are thinking and moving. It is a law of physics, a body in motion stays in motion, a body at rest stays at rest. Better to be in motion and able to move then to be sitting quietly accepting your fate at the hands of an evil person. I find everything in this piece laughable. There was a time in not only Michigan, but in America as well, when schools had shooting clubs/teams. Kids brought firearms to school. They not only learned to use them responsibly, but safely as well. Americans also didn't need the government's permission to purchase a firearm. Unlike today where the process works so spectacularly well. Good luck finding anything regarding any mass school shootings occurring during that time not that long ago. Fast-forward to 2019 when the best the so-called "experts" can come up with is a strategy in which someone's (other than the shooter's) life is threatened during the attack and money is flushed down the toilet promoting these "solutions". No wonder why the public schools are claiming that they have no money in their budgets for the important things. University of Texas tower shooting: 25-year-old engineering student, Charles Whitman, shot and killed 15 people and wounded 31 during a 96-minute shooting rampage from the observation deck of the university. He was shot and killed by police. He had earlier murdered his wife and mother at their homes. It was the deadliest shooting on a U.S. college campus until the Virginia Tech shooting in 2007. How many middle-schoolers attended Univ. of Texas again? These are measures that wouldn't hurt but they aren't likely to help much. When will you people understand that soft targets will always be soft targets no matter what you do. Criminals will keep going to gun free zones no matter how hard you whip a puck. I'm so glad I don't have kids in school with incompetent liberals at the helm.